Peche Fest beers have been announced the beers and descriptions for their second annual festival by Saraveza. The event will take place in The Bad Habit Room at Saraveza located at 1004 N. Killingsworth St in Portland. More details can be found below. 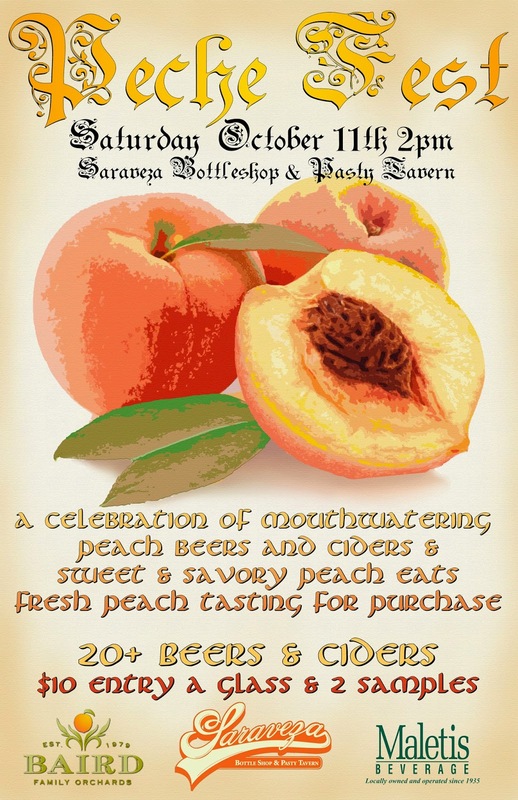 If you do not like peaches, then this fest is not for you, but if you love beer, cider, and the world’s most delicious fruit, then the 2nd annual Peche Fest may be the greatest thing that’s happened since God tempted Adam and Eve with a forbidden fruit (that most certainly was a peach). From the creators of the Portland Fruit Beer Festival and Farmhouse and Wild Ale Festival comes the 2nd annual Peche Fest. Featuring 19 beers, 5 ciders, and a mead from some of our favorite crafters, many of which are extremely rare and some even one-off creations exclusively for this festival. A $10 entry fee gets you a beautiful Peche Fest stamped glass and 2 drink tickets good for 5oz pours. Additional tickets are $2 each. Presented by Saraveza and Bad Habit Room with a special menu of peach food specials, a peach cocktail, and fermented peach drinks. Advanced tickets are on sale now. Almanac Brewing - Brandy Barrel Peche: Historically, fruit-infused sour beers were a way of preserving the summer harvest. In that tradition, this blonde ale was added to brandy barrels with high-summer peaches, hand-picked by the Loewen family at Blossom Bluff Orchards in Reedley, California. We aged this liquid gold for six months until we needed a reminder that summer will come again. Pair with Prosciutto, crusty bread and fruit preserves. Block 15 Brewing - Fuzzy Wuzzy: Berliner/farmhouse hybrid with brett and peaches, briefly aged in 2nd run gin barrels. Breakside Brewery - Peach Sour Golden: Our seasonal passionfruit Sour minus the passionfuit, but aged on peaches instead! Deschutes Brewery - Peach Slap: Originally created for the Portland Fruit Beer Fest, brewed again due to popular demand! A crisp, tart, Belgian ale brewed with juniper berries and pink peppercorn. The addition of house made peach and habanero syrup rounds out this light and refreshing beer with a little subtle heat. Dogfish Head - Festina Peche: A refreshing neo Berliner-Weisse. Served as an apertif or summertime quencher, Festina is delicately hopped and has a pale straw color. To soften the intense sourness, Berliner Weisse is traditionally served with a dash of essence of woodruff or raspberry syrup. In Festina Peche, since the natural peach sugars are eaten by the yeast, the fruit complexity is woven into both the aroma and the taste of the beer so there is no need to doctor it with woodruff or raspberry syrup. Just open and enjoy! Elysian Brewing - Gourdgia On My Mind Peach Pecan Pumpkin Amber: Brewed with Pale, Munich, TF Amber, pale chocolate, & brown malt. Pecan meal added to the mash, bitterer with Magnum hops, with 6 gallons of karo syrup to kettle, cinnamon in the whirlpool and 126 pounds of peach purée added during fermentation. Epic Ales - Brainless on Peaches: We took our double gold medal winning Brainless® Belgian, added peach puree and aged it in French Chardonnay casks. It develops nicely as it warms displaying more fruit and wine. Hi-Wheel Wine & Mead - Peche Deesse: Lemon base is used in this yummy summery treat. A whole box of organic peaches is added to the secondary fermenter to honor the goddess of peaches. Logsdon Farmhouse Ales: Peche n’ Brett: Our Seizoen Bretta oak aged and loaded with tons of local organic peaches (a pound and a half per gallon). Blue Mountain Cider - Peach: Sparkling apple cider and a splash of fresh peach meet to make the perfect combination of acidity and sweetness.